E outra lambonada! Desta vez, con pexegos 🙂 Para facela máis rápida e sinxela, empreguei pexegos en almíbar, pero se os tendes de colleita propia, aproveitade! Xa vos indicarei como facelo no paso a paso. A presenza non é o seu punto forte, pero de sabor está boísima! E en media horiña, teredes a torta preparada. Imos aló! 1. Colocamos a masa brisa sobre o molde e picámola moito co garfo, as beiras tamén. 2. Enfornámola durante 15 minutos a 180°C e reservamos. 3. Se a facedes con pexegos naturais, teremos que cocer dous pexegos (xa en metades) en auga con azucre ata que estean algo brandiños. E gardaremos o almíbar. Despois, trituramos as 4 metades e as galletas, e mesturamos co almíbar e a aménoa. 4. Esparexemos esta mestura sobre a masa, e engadimos as 7 metades de pexego que nos quedan. 5. Enfornamos de novo durante 15 minutos a 180°C. E listo! Para servila, podemos botarlle azucre en po por riba. 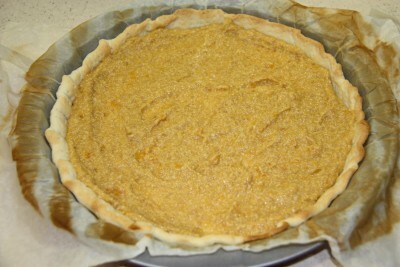 É unha torta de sabor suave e, como vedes, queda ben finiña. Se preferides que o recheo quede máis gordiño, dobrade os ingredientes (agás as metades que empreguemos para poñer por riba, que seguirán sendo 7). Podedes probar con outras froitas que vos gusten, porque será ben sabedeira! 😛 Bo proveito! Another sweety treat! This time, we will be using peaches 🙂 They’re so yummy in summer! 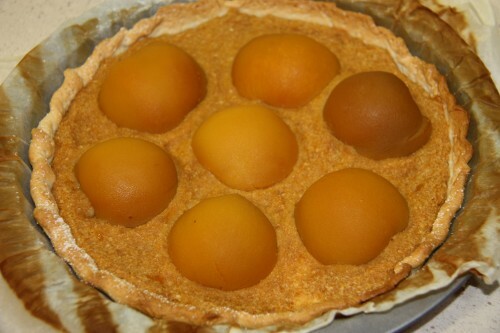 To prepare it faster, I used peach halves in syrup, but you can do it with fresh ones, I will tell you how to do it along the step by step. Although the way it looks is not its strongest point, the flavour is absolutely amazing! 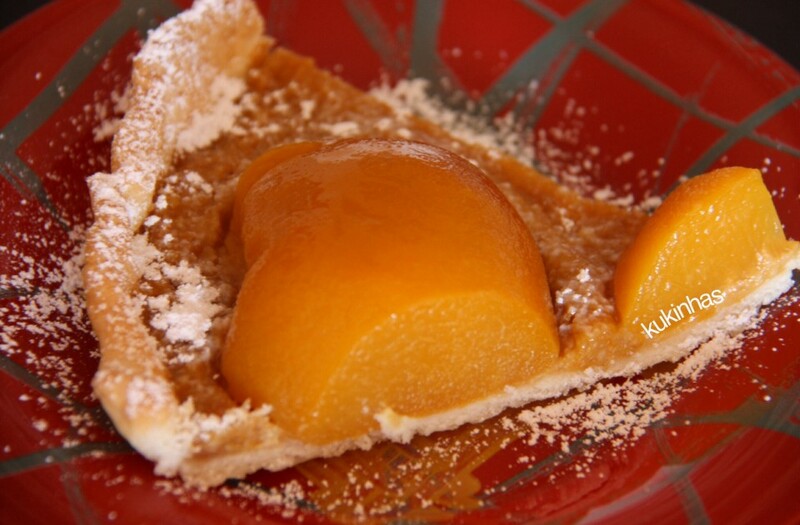 So, if you have just 30 minutes, you’ll get a very delicious peach tart. Let’s go! 1. 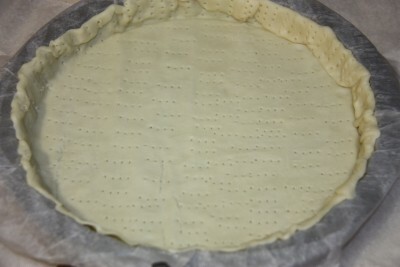 Put the shorcrust pastry disk over the baking mould and pinch it (a lot!) with a fork, even the edges. 2. 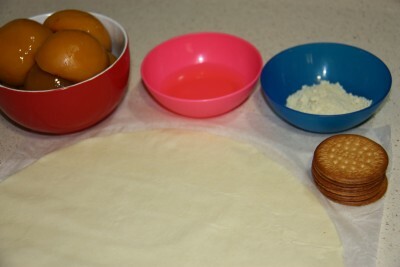 Bake it for 15 minutes at 180°C/375°F and keep for later. 3. 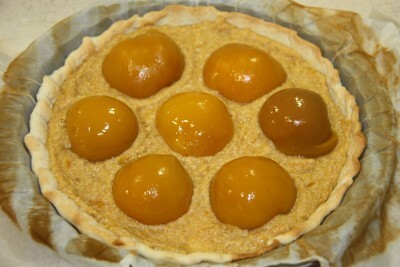 If you prepare it with fresh peaches, boil 2 of them (already in 4 halves) until soft and smooth. Keep the sugar syrup. 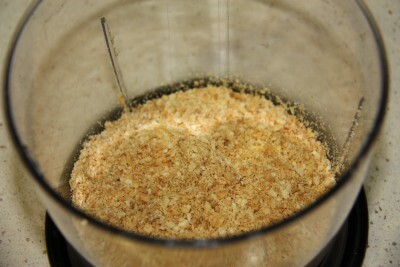 Then, process the 4 halves and the biscuits in a food processor, and mix them with the syrup and the almond. 4. 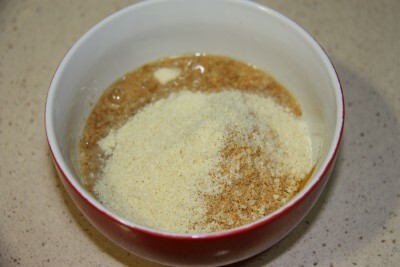 Spread this mixture over the pastry and put the 7 halves left on top. 5. Bake it at 180°C/375°C for another 15 minutes. And that’s it! To serve it, top it with some powdered sugar. 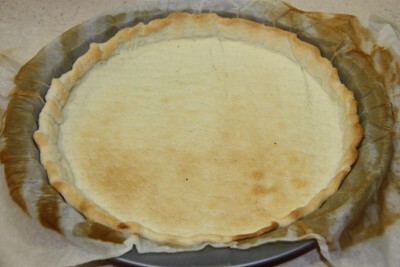 It’s a tart with a very soft and smooth flavour, and as you can see, the filling is quite thin, if you want to do it bigger, just double the ingredients, except the halves we used on top. 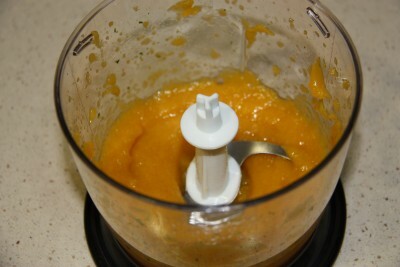 You can try it with other fruits you like because it will be delicious anyway. 😛 Enjoy it!